Congratulations to tour winner Amy B. and to host winners Journey of a Bookseller and The Pen and Muse Book Reviews. Goddess Fish Promotions is organizing a Virtual REVIEW ONLY Tour for Sophie Washington: Secret Santa by Tonya Duncan Ellis, a 122 page Children's Middle Grade book available October 26. The tour will run every Monday for 4 weeks starting on October 29, and the book is available in PDF format. Tonya Duncan Ellis will be awarding $20 Amazon/BN GC to a randomly drawn winner via rafflecopter during the tour, and a $20 Amazon/BN GC to a randomly drawn host. Additionally, Goddess Fish Productions will be awarding a $5 Amazon GC to a randomly drawn host. Christmas is three weeks away and a mysterious "Santa" has been mailing presents to sixth grader Sophie Washington. 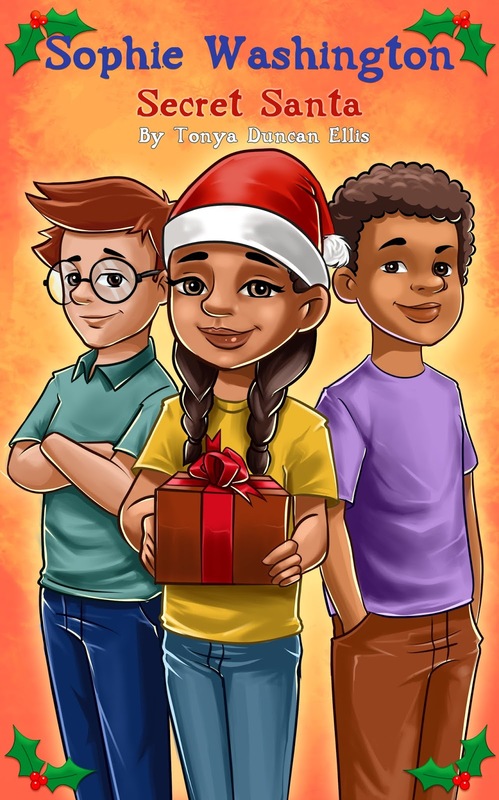 Her friends guess that the secret Kris Kringle could be either Nathan Jones or Toby Johnson, two boys in Sophie's class who have liked her in the past, but she's not sure. Sophie uncovers clues to find her secret Santa and the final reveal is bigger than any package she's opened on Christmas morning. It's a holiday surprise she'll never forget!